Comment below if you love mashed potatoes! What if I told you this wasn’t mashed potatoes. What if I said this warm plate of creamy garlic mash was actually made of cauliflower. Would you try it? Before you rethink your decision, give this recipe a try. Have a heaping spoon with some braised short ribs, or add it as a side with your Thanksgiving feast and lighten things up. WARNING: Following the consumption of this Cauliflower Garlic Mash there may be sudden outbursts of joy, excessive smiling, and out of control requests for more. 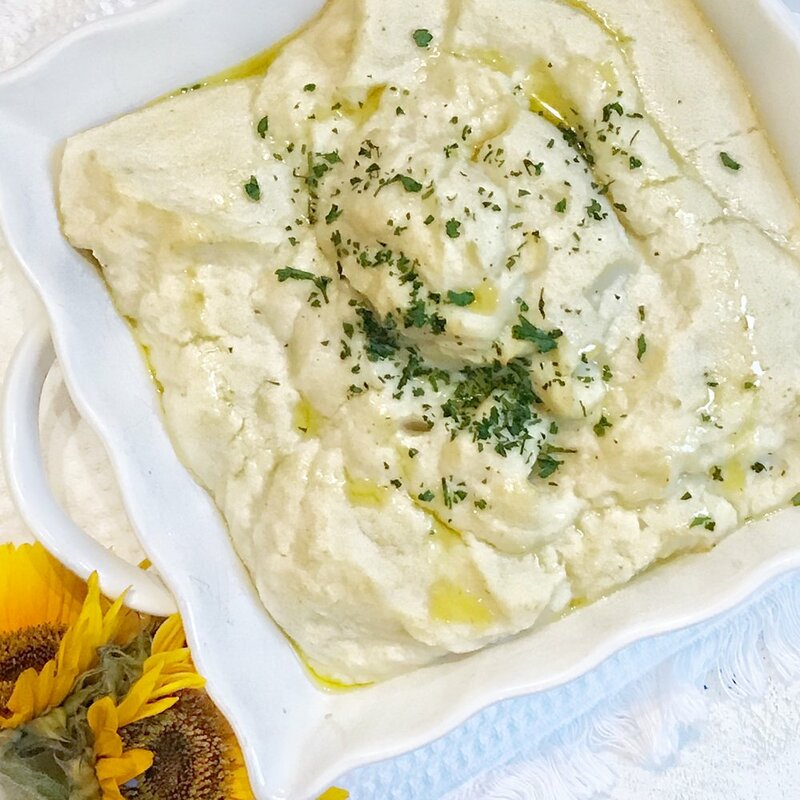 Photo Description: Creamy Cauliflower Garlic Mash in a square serving dish on top of a white fringe cloth and 2 sunflowers in the bottom left corner. Place the cauliflower florets in to a large stock pot and cover with the chicken broth and water. Cook for 8-12 minutes or until fork tender. Drain and keep the in the colander and move onto next steps. You want to get as much water as possible out of the cauliflower. Pour the olive oil into the stock pot and sauté the garlic until fragrant. Remove from heat and return the cooked cauliflower back into the stock pot, add milk and butter. Using an emersion blender purée until smooth and creamy. Taste for salt and pepper. Garnish with chopped parsley, drizzle extra virgin olive oil over top and serve warm. Refrain from adding additional butter and/or milk to the mash, it will thin out too much. Recipe: Breakfast Hash in 30 Minutes! I thought I would bring you a little BREAKFAST HASH on this gorgeous sunny morning. Not only does it taste fantastic, this nutrient packed meal clocks in at 30 minutes total cook time! Oh YAAAASSSSSSS! AND don’t forget to include this simple and easy meal to your weekly meal prep recipe box. This recipe should take centre stage on every brunch table, and serve it directly from the baking sheet - family style. Honestly, this quick and simple meal will tantalize your tastebuds, warm your belly, and have you dancing all the way to the kitchen sink when you're done. It's THAT GOOD! Adjust your oven rack in the middle of the oven and heat to 425°F. With a little olive oil lightly coat a rimmed baking sheet. 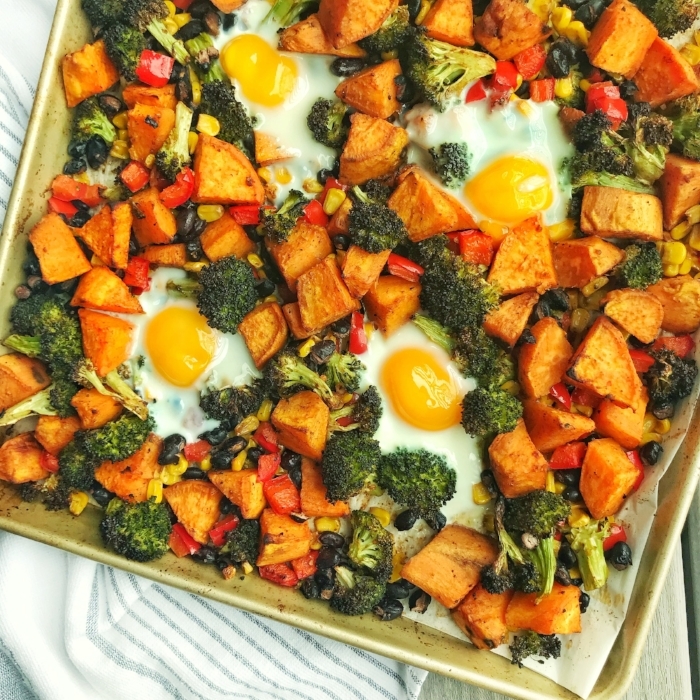 Place the sweet potatoes, broccoli florets, bell pepper, black beans, and corn in a single layer on the prepared baking sheet. Add the 3 tablespoons olive oil, garlic, chili powder, cumin, and paprika. Season with salt and pepper and gently toss to combine. Bake for 15 to 18 minutes stirring halfway through, until the sweet potatoes are tender. Remove the pan from the oven and create 6 wells in the vegetables. Gently crack an egg into each well, keeping the yolk intact; season the eggs with salt and pepper. Return the pan to the oven and bake 7 to 9 minutes, or until the egg whites have set. You can enjoy this dish immediately or portion it out into your to-go containers and pack it up and you have breakfast for the week. When chopping your veggies, try and cut them to bite size pieces and keep them roughly the same size to ensure even cooking throughout your dish. To make this dish even easier, buy pre-cut vegetables from you local grocery store and cut back even more on your prep time. The olive oil can be substituted out for avocado oil or grape seed oil if you prefer. Leftovers can be stored in an airtight container and refrigerated for up to 5 days. I love a good fridge clean out. It always produces some of my favourite meals. Opening the refrigerator door, scanning shelves and drawers for ingredients that will make up your meal. 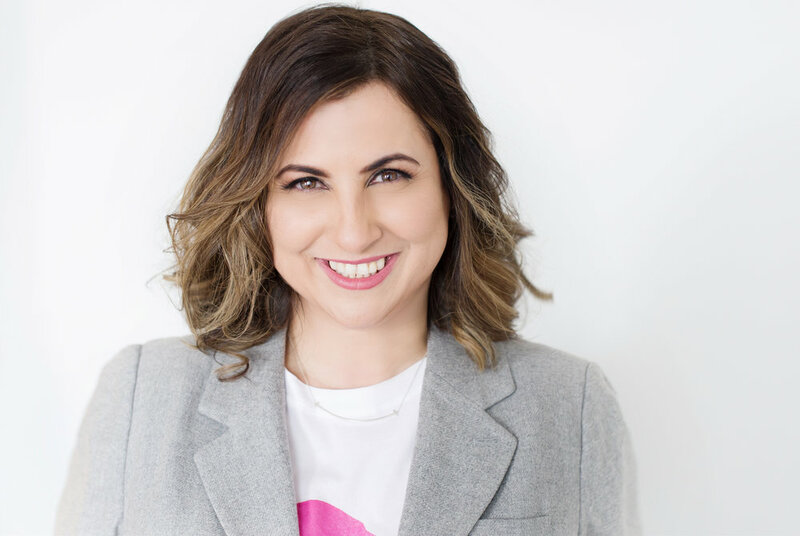 Rant: Detox, Destress, Drink This, Eat That - What Does it All Mean? Have you ever wondered why we're told to eat this, drink that, no fat, eat fat, no carbs, eat the right carbs. Why? Seriously, I'm asking because I'm more confused now than ever before. I can’t keep up! Today on Kelly and Company we talked about the post holiday aftermath left in our pantries and refrigerators. Dealing with the plethora of odds and ends of food occupying prime real estate in our refrigerators. Sharing with you a few ideas and recipes …. Happy Monday! Today was a whirl wind of a day. I've done so much but yet I feel like I haven't accomplished anything. With zero time to cook a full meal this is when my pre-made frozen meals come in handy. Let me begin by saying, I am THAT person. You know the one, who lives for every Fall Cliche. It's that time of year when Pumpkin Spice is sprinkled on everything. We’re all guilty of saying “I’m so busy” at least once a day. Has this become the new normal? Have these three words become the scapegoat of 2017? Get ready to enjoy this quick and easy Sheet Pan Chicken and Sweet Potato dinner. A complete meal made in one pan and ready in 40 minutes. Not a carnivore? Fish not your thing? Go ahead and sprinkle some of this seasoning on a fresh Portobello mushroom and grill. Music continues to surround my kitchen as Neneh Cherry fades Rihanna "werks" her way into the room with "PEAS" Don't Stop The Music. I belt out lyrics that only I understand and continue to prepare what I've decided will be a Sautéed Asparagus and Peas side dish. Mediterranean Pasta Salad because ...... why not? This dish had me at Pasta. Clean the potatoes and slice the sweet potato into even wedges an place in a large bowl. Pour the olive oil and spices over the sweet potato wedges. Use your hands to coat the sweet potatoes with the olive oil and spices. Pour the seasoned sweet potatoes onto a rimmed cookie sheet and place in the oven for 20 minutes, take them out of the oven and flip them, place them back in the oven and bake for another 10 – 15 minutes. NOTE: The baking time will vary depending on how big your wedges are. If you want them crispier, just bake them for a few minutes longer. Spring has sprung and so have these veggies. Straight from the fridge right into this pan. Heat the olive oil in a medium to large frying pan over medium-low heat. Add the shallots and cook, stirring frequently, until soft and translucent, 4-5 minutes. Add the asparagus, ¼ teaspoon salt and freshly ground black pepper to taste. Continue cooking over medium-low heat, stirring frequently trying not to burn the shallots, for about 5 minutes or until tender-crisp. Add the peas and cook about one minute more until the peas are warmed through. Add a little more salt and pepper if needed and serve.